spongebob is 이모. . Wallpaper and background images in the 스폰지밥 네모바지 club tagged: emo spongebob squarepants. He looks adorable in a way! 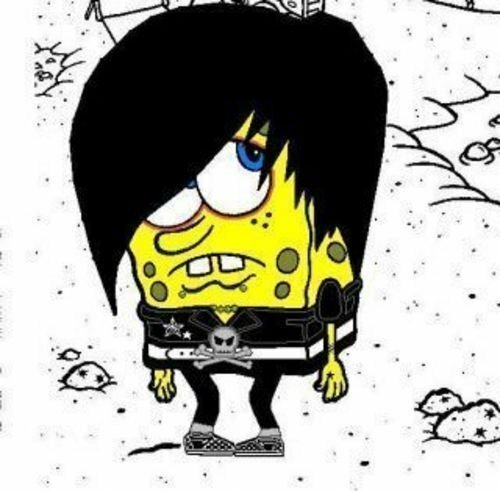 i love u emo spongey!!!! Hahaha I have this same picture in my phone! It's so awesome! mmmmm monkey monkey mmmmm monkey yeeeaaahhhhh!!! THATS AWESOME I HAVE THIS PHOTO AS MY BACK GROUND !!! I have this picture! i love this picture! oh god... not even SPONGEBOB is safe from the emos Dx WHAT HAS THE WORLD COME TOO!?!?!?!?!?!? i HAVE THE SAME PIC ON MY PHONE!!!! Suxxx!!!! Spongebob cant be even closer to a look like this! And he isnt supposed to be sad!! He should be happy! awww y so sad spongebob? IK a vampire when i see one, and THAT is not a vampire spongebob. Oh, this is so disqusting. You know I don't like emo.. Anyway, if his mood is not like that, this picture would be cool/awesome. There's nothing wrong with being emo. And that doesn't even exist! Emotional music is what it stands for. It's a genre of music, not a way you dress. Besides, he does not have to be labeled as emo, maybe he just suddenly is attracted to the color black.